The term “bedroom artist” evokes all sorts of knee jerk responses from anyone who has an opinion on the subject. Whatever your personal feelings, it’s hard to deny the fact that this secluded form of creation has yielded some impressive albums from some now well-known artists. Enter the next bedroom sensation from Sweden. Her name is Sophia Somajo, but you can call her Soso. The self-made do-it-yourself artist wrote, produced, recorded, and released her album, The Time I Dug So Deep I Ended Up In China, all within the confines of her apartment. The lo-fi electro-based album provides a detailed legend into the personal life of Soso — the album title is what her mother used to say to her while Soso played in the sandbox, “Joaquin Phoenix” is a love note of a song she wrote about the actor after watching his film I’m Still Here, and the track “Sab Lackath” is literally a song composed of the sobs and cries of Soso in her bedroom. Don’t be fooled, the personal nature of the album in no way generates a somber tone. TTIDSDIEUIC is quite the opposite. 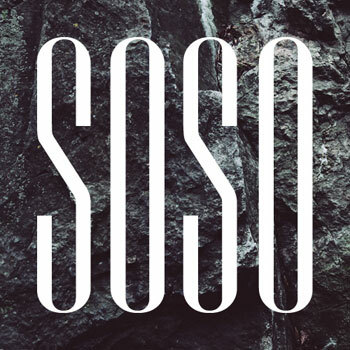 Soso‘s fluttering vocals show a powerful range and each of the self-produced tracks has a definite edginess that covers you in a dirty layer of grit. Soso‘s version of Cody Chestnutt‘s “My Women My Guitars” arguably surpasses the originator’s version in arrangement and tone, and even in the “cool factor” arena, which speaks volumes considering Chestnutt is cooler than a polar bear’s toe nails. Fans of Polica‘s Give You The Ghost and Grimes‘ Visions will want to snag TTIDSDIEUIC which Soso is giving away for free on her website.